A culture shock in Bangalore City! We are proud to be artists of Bangalore, which provides its people with well defined art and culture and receives every individual's interest with a warm welcome. Life for any one is peaceful in Bangalore. We, as well established performing artists of Bangalore vouch for a cordial relationship between every artist here. But as they say, every peaceful life confront hurdles at some point of time, we too experienced it. We, the artists would like to share one such bitter experience with all the readers of Narthaki. 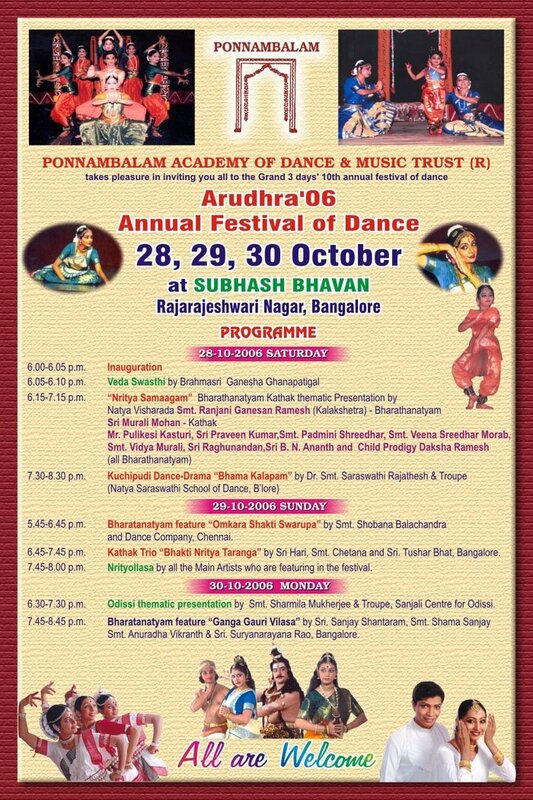 Popular dance group of Bangalore consisting of well established performing artists Anuradha Vikranth, Sanjay Shantaram and Shama Sanjay who are the key artists of the group, were invited to perform at the Arudra Dance Festival organized by Ponnambalam Dance Academy. As requested by the organizer, we were to stage 'Ganga Gowri Vilasa,' a dance production which involved many artists. The venue was Subhash Bhavan, which is located amidst residential layout in a distant corner of Bangalore. The slot given to us was 7.45pm (email Invite). Considering the Bangalore traffic and the distance of the venue, one group of artists arrived at 7.15pm, who were all dressed for the show except one artist Sanjay Shantaram who had to wear a Shiva mudi, which he had to do only after he reached the venue. Anuradha Vikranth and other set of the artists arrived at 7.35pm, while the previous dancer Sharmila Mukherjee was still on stage performing. Since it was a very small auditorium and green room had no separate entry we had to wait outside the auditorium as the previous performance was still going on. Instead of greeting the artists who have come there with a sole intention to perform without any benefits, one of the oraganiser (Malavika Avinash) passes sarcastic comments and abuses the dancers for not having come two hours early. Uses all bad language and insulted all the artists, who was further joined by her father Mr. Ganesan, and dancer sister, Ranjani Ganesan. It was truly hurting as an artist and as an individual and all the artists decided to walk out without performing. As a responsibility towards the audience, we had to apologise for not being able to perform. These organisers who try to gain publicity by organising such a dance festival think they are beyond art and artists which will surely not take them far if they do not respect Art. We have no regrets for having done this and are proud not to have let down our Art. Maybe the dancer and the organisation have not got enough publicity for their festival and hence are using this as means of publicity. A similar incident took place in the month of February. The same organisation had conducted "Damaru Mahotsava" for Shivaratri. Shama Sanjay and Sanjay Shantaram were asked to perform at 12.30am. When they reached the venue with great difficulty, all that they found was the closed door of the auditorium. The organizers had left the venue without even informing the artists when they very well knew that the artists were heading towards the venue for the performance. They had even switched of their cell phones. In spite of this incident these dancers agreed to perform only on the request of their other group member. We just had to share this experience with all artists who could be cautious about performing for such organisations which does not value Art or the Artist. We have observed that the organizers of the Arudhra Festival are trying to gain publicity by first creating a scene at the auditorium, secondly instead of sorting out the differences between them and the group which did not perform, they go public by sending e-mails, sms's and now even online. "We would like to also bring to your notice about misbehavior on the part of a budding dancer..."
The organisers had been co-coordinating only with this dancer for the performance at their festival and not even extended a courtesy invitation to the other well known artists of the group. The dancer, who has been referred to as the budding dancer, is a well established performing artist of Bangalore and it is surprising the organisers are not aware of this. "who walked out of the festival without regretting the fact that she turned up for a 7.30 show (TO commence) at 8.00pm..."
It is shocking that the organiser themselves do not remember the time slot allotted to this group. The time allotted was 7.45 and not 7.30. (Email of the invitation attached for the reference). Sharmila Mukherjee who finished her performance around 7.50pm, was still performing her third piece, when the group members were present at the venue completely ready with their costumes and makeup. The dancers were on time for their performance. "...while some of her troupe members entered the auditorium at 7.15 sans makeup..."
All the dancers were ready with makeup and costume except one of the key artist who was playing the character of Shiva had to put on the Shiva mudi (headgear). I am sure you will all agree that one cannot sit and drive for an hour wearing the mudi. "We had to reschedule even the first concert of the evening since these artists had not come." "Having put the organisers and the audience to an inconvenient situation by coming late..."
Audience was still enjoying the Odissi performance by Sharmila and her troupe when the artists had arrived, so where is the question of putting anyone in inconvenient situation? "Even as another senior artist who was to perform with this budding dancer was keen to perform, was left helpless..."
I would like to remind the organisers that I was not helpless; rather performing at that platform after all this, would be like losing our self dignity. We have no regrets for what we did. Is it not natural for a performer to reach the auditorium a good 2 hours before the show to warm up and prepare for the show? Yes it is! provided the auditorium is big enough and the green rooms can accommodate ten dancers. But in a place which did not have a separate entry to the green room and a green room which was not sufficient even for three members, how do they expect the artists to be 2 hours early for the show? The hall could not accommodate more than hundred and odd people – not in context with the issue, just a publicity punch to prove that the festival had huge audience. Ranjani Ganesan Ramesh is one of the organizers of this festival, isn't it natural she has to be present in the auditorium? This is not the way one should seek publicity. Seniority of an artist lies in her dignity and culture, not by number of years spent titling herself as a dancer. Art is greater than any artist and no artist can survive without patrons. Yes! Art is greater than any artist. But no art or artist, need such patrons who try to gain importance / publicity using art and artists and also with this motive conduct festivals. Art is above any artist, it is a prime motive of any performing artist to perform on a platform and share the joy of dance -having got dressed to perform, driving for 2 hours to reach the venue and considering one has to drive back for two hours. With due respect to the audience and the organiser, no artist would like to walk out without performing unless the situation demands. We are grateful to all the dancers who stand by us on this decision.